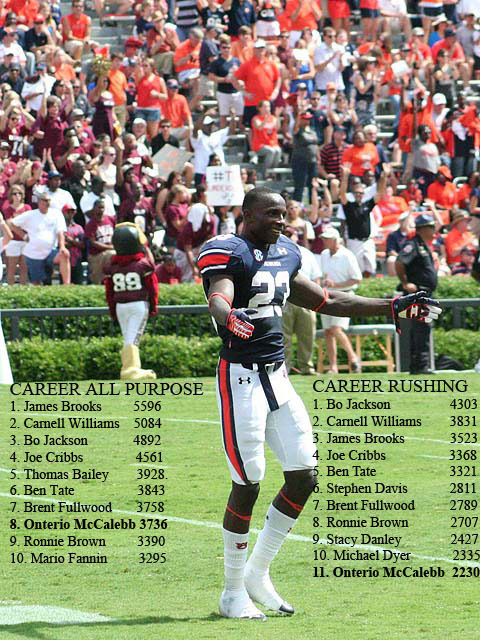 When it comes to All Purpose Yards, Ronnie Brown and Mario Fannin have been caught like so many squirrels. Michael Dyer is one decent game from being smoked out of the Top 10 in the Career Rushing column. Onterio, Onterio, wherefore art thou Onterio? Graphic ‘n’ stats by Kenny Smith. Gotta love O-mac, but seeing that makes me realize once again how freaking awesome Cadillac Williams was. Considering he lost a combined half-season to injury, while sharing a crowded backfield, Williams’ numbers have always impressed. I guess Tre Smith’s on the center-foldout? If we extrapolate Dyer’s 2-season average (1167 yds/season) out 4 years he would have broken Bo’s record. You have to think he would have done well in Loefler’s style of offense. Very unfortunate. Congratulations to Omac. He has been an exciting player and we will miss him next year.